The private pilot was preparing for his commercial checkride with a flight instructor onboard. They had completed several touch-and-go landings when the engine experienced a partial loss of power on the downwind leg of the airport traffic pattern. Attempts to restore power were unsuccessful, and the pilots selected a field for a forced landing. The airplane came to a stop after impacting a fence. A postaccident examination found that fuel was available in both wing tanks. An initial test of the fuel system found that fuel would not flow from the right wing fuel tank; however, the condition could not be replicated during a subsequent test. A test run of the engine revealed no anomalies. The fuel line pickup screen in the right wing fuel tank was clear and no foreign material was observed in the fuel tank. The carburetor icing probability chart indicated that the airplane was operating in an area associated with a serious risk of carburetor ice accumulation at glide power settings. Despite the risk of carburetor icing, the airplane had completed several takeoffs and landings without problems and the pilots stated that they applied carburetor heat following the loss of power; therefore, it is unlikely that the loss of power was the result of carburetor ice accumulation. The reason for the loss of engine power could not be determined based on the available information. A partial loss of engine power for reasons that could not be determined based on the available information. 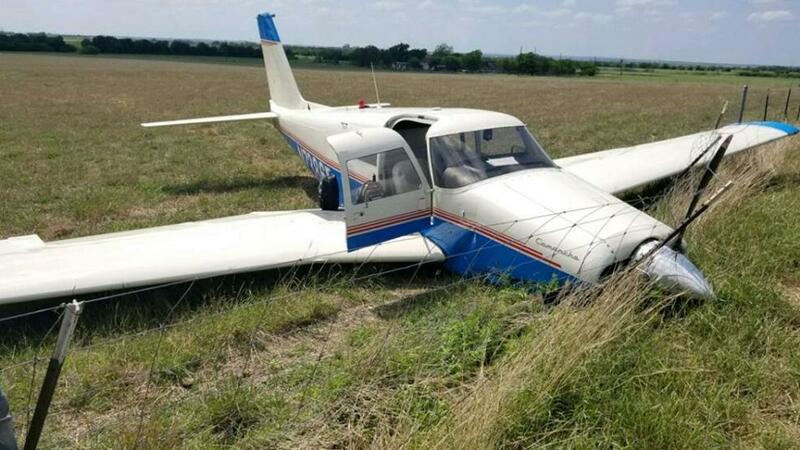 On April 12, 2018, about 1500 central daylight time, a Piper PA-24 airplane, N7386P, conducted a forced landing near New Braunfels, Texas. The flight instructor and pilot receiving instruction received minor injuries, and the airplane was substantially damaged during the landing. The airplane was registered to and operated by a private individual, under the provisions of 14 Code of Federal Regulations Part 91 training flight. Visual meteorological conditions prevailed at the time. The pilot reported that he was preparing for his commercial pilot check ride with an instructor. He added that they had been in the traffic pattern for some time and was on the last landing. He configured the airplane for the landing and felt and heard what seemed like the engine smoothly retarding to idle. He informed the instructor that the engine had lost power. He added that they checked the emergency checklist; made sure the fuel pump was on, the mixture was full rich, propeller lever was full forward, fuel selector was on the proper tank, and the carburetor heat was selected. The flight instructor reported that she heard the engine power decrease and thought the pilot had reduced the power. However, the pilot stated that he lost throttle authority. She then grabbed the throttle and pumped it from idle to full throttle several times, with no response from the engine. She added that both of them, verified the sure the fuel pump was on, the mixture was full rich, propeller lever was full forward, fuel selector was on the proper tank, and the carburetor heat was selected. Unable to make the runway, the instructor informed the tower controller that they were making a forced landing to a field. The airplane came to a stop after colliding with a fence. The responding Federal Aviation Administration (FAA) inspector noted fuel was available in both wing fuel tanks, the airplane's landing gear had collapsed and there was substantial damage to the fuselage. The inspector noted that the pilots stated that the fuel selector was on the right-side fuel tank. The inspector conducted an initial test of the fuel system on site, which indicated that fuel would not flow when the right tank was selected. During recovery, the airplane was placed on stands, with the NTSB Investigator in Charge (IIC), FAA inspectors, and the owner's representative present, the fuel line was disconnected near the engine and the fuel test conducted again. This time, fuel was able when each tank was selected. The airplane was then partially dissembled and transported to a salvage facility. On April 15, 2018, the NTSB IIC conducted an engine run on the accident airplane. The fuselage, with the wings removed for transport, was placed on a flat bed trailer. In order to run the engine, the damaged 3-bladed propeller and the carburetor air box were replaced. The exhaust pipe was crushed near the tip, so about an 8-inch section of the exhaust pipe was cut off. A fuel can was attached to the fuel line, near the right-wing root location. The engine was primed via the electric boost pump. The engine was then started and run to power. The fuel line was then disconnected and attached to the left side fuel line; the engine test was then repeated. The engine operated without any anomalies noted. An access cover plate, located on the root end of the right wing, was removed. The fuel tank bladder was opened to allow access into the fuel tank. The fuel line pickup screen was clear of any blockage and no foreign material was seen in the fuel tank. The carburetor icing probability chart included in Federal Aviation Administration Special Airworthiness Information Bulletin No. CE-09-35, Carburetor Icing Prevention, indicated that the airplane was operating in an area that was associated with a serious risk of carburetor ice accumulation at glide power settings.